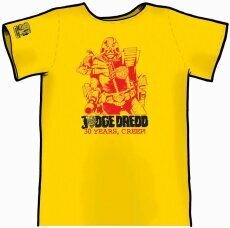 As the Galaxy’s Greatest Comic surges beyond three decades of Thrill-power, what better way of marking its place in history as the most pulse-pounding publication your planet has ever seen than with this zarjaz commemorative Judge Dredd T-shirt, featuring classic artwork from art droid supremo Mick McMahon? And if you subscribe to 2000 AD and the Judge Dredd Megazine, it’s yours for free! This limited edition garment won’t be available in any Thrill-merchants, so don’t delay – subscribe now and proudly display your allegiance to the Comic of Tomorrow. As if a free T-shirt wasn’t incentive enough, in addition to having 2000 AD and the Judge Dredd Megazine delivered straight to your door, it’s never been better value to subscribe to both titles. Subs charges have been frozen, so you’ll beat the recent rise in 2000 AD’s cover price. Please click HERE to subscribe online, or alternatively you can subscribe using any of the contact methods listed above. Please make out cheques to Rebellion Subscriptions. Minimum subscription one year. Overseas subscribers will be subject to a nominal postage charge of £2 for the subscription gift. All of the above rates include postage. Megazine subscribers receives 13 issues per year but are charged 12 times in the course of a year (if billing is monthly).